I’ve been on a circus animal cookie kick recently. 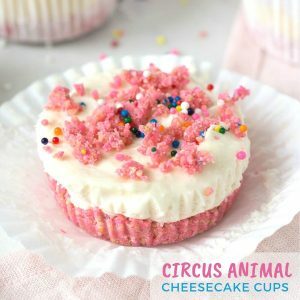 After I made these cute Circus Animal Truffles and adorable Cheesecake Cups, a friend asked me, “Where can I buy circus animal cookie ice cream! ?” I quickly realized I’d never seen such a glorious concoction in a store before. 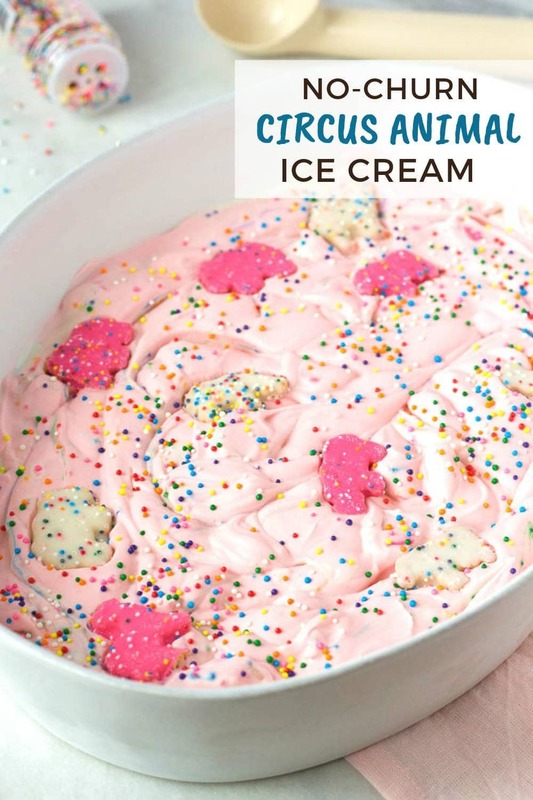 So I quickly set to work on this incredibly easy and delicious Circus Animal Cookies Ice Cream recipe. 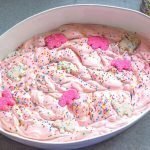 This no-churn recipe is made with pink and white animal cookies and packed with extra sprinkles. 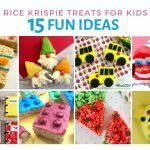 It is perfect for a kid’s birthday party or a cute baby shower dessert. Or in my case, a sweet treat for the freezer than I eat straight from the container. 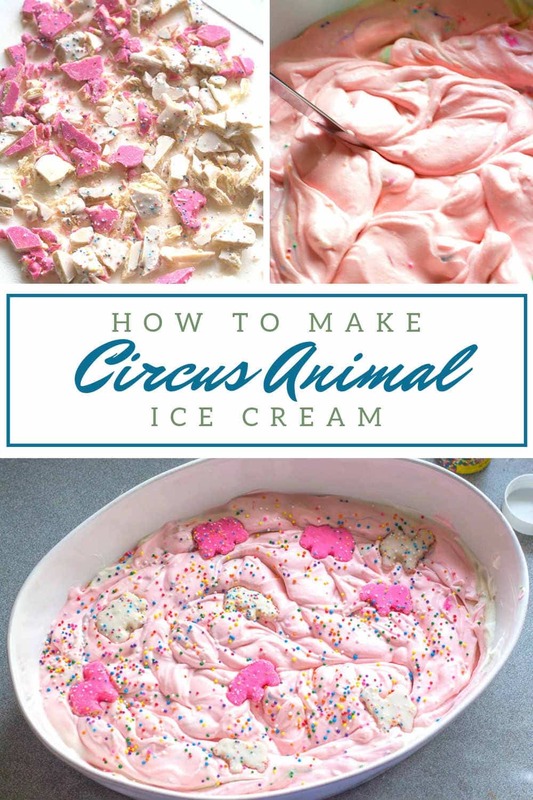 Here is everything you’ll need to make this circus animal ice cream, along with a few suggestions. Not to be confused with iced animal cookies or iced animal crackers with sprinkles! You want the real deal for this recipe. 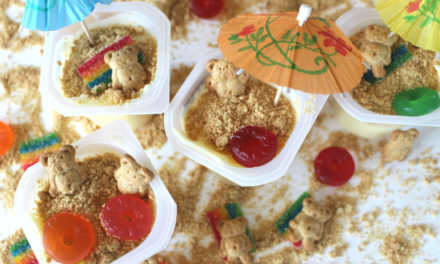 Mother’s Circus Animal Cookies are one of the best and well-known brands. Heavy whipping cream. It comes in a little carton and can be found near the milk in the grocery store. Sweetened condensed milk. You can find a small can of this in the baking aisle. I highly recommend using vanilla paste instead of extract. The flavor and aroma are amazing. One thing to be aware of is that the paste has tiny flecks of real vanilla bean in it. The tiny vanilla bean bits will be visible in your final product. I personally like the look of the flecks. I think it’s kinda fancy! A couple brands that I personally use and recommend are Neilsen-Massey and Cambie Confections. 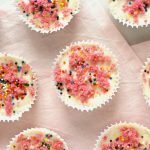 I achieved the gorgeous pink color in this recipe with only a few drops of food coloring. I’ve used all types of food coloring in the past, but AmeriColor are at the top of my list. The colors are so vibrant and the consistency of the gel makes it really easy to add just a drop at a time. The colors blend quickly and easily. 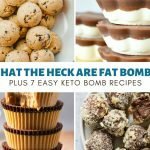 I highly recommend you give them a try. Tons of colors and sets are available on Amazon. and be suitable for your occasion if you plan to serve at a party. These pink polka dot paper containers are really cute! Next, put the serving container in the freezer to get it nice and cold. Grab your cutting board and knife and give the cookies a rough chop. They should be about the size that you’d like to bite into when taking a scoop of ice cream. We’re going to play a little game of musical bowls here so stick with me! Grab your first bowl and add the sweetened condensed milk, vanilla and chopped cookies. In the other bowl, add the heavy whipping cream. 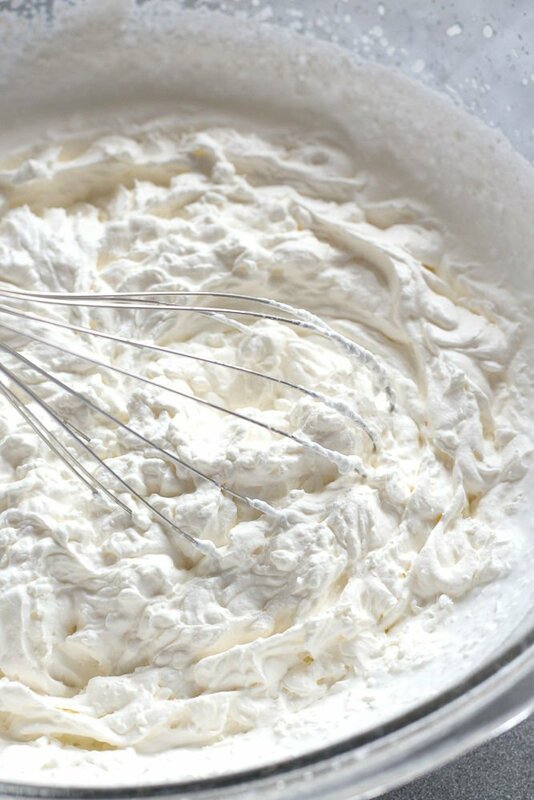 Using your preferred method (electric hand mixer, stand mixer or whisk), whip the cream until stiff peaks form. Add about a cup of the whipped cream to the first bowl and fold it gently into the condensed milk mixture. 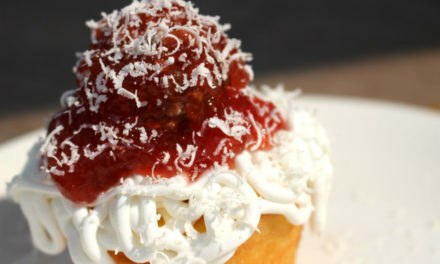 Then add the remaining whipped cream and incorporate well. Work quickly, but gently. Now transfer about half of the combined mixture back to the other bowl. Add a few drops of food coloring until you achieve a beautiful pastel pink color. 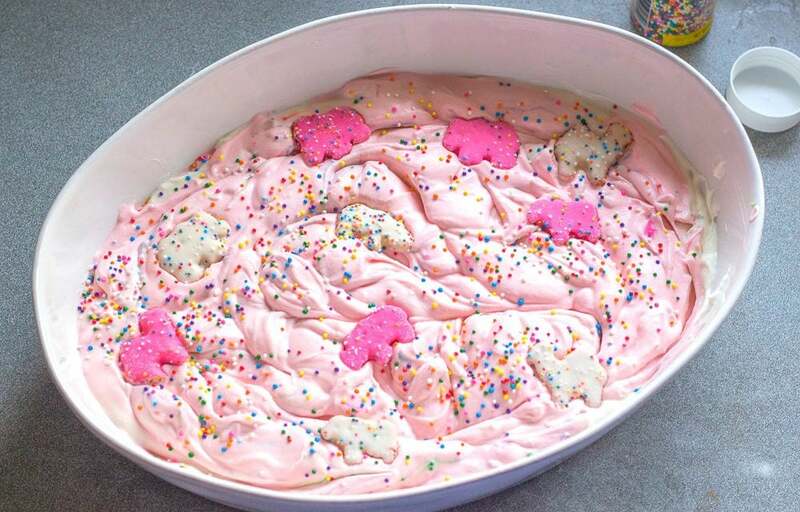 The next step is to assemble the white and pink ice cream bases and add in the sprinkles and extra cookie chunks if desired. 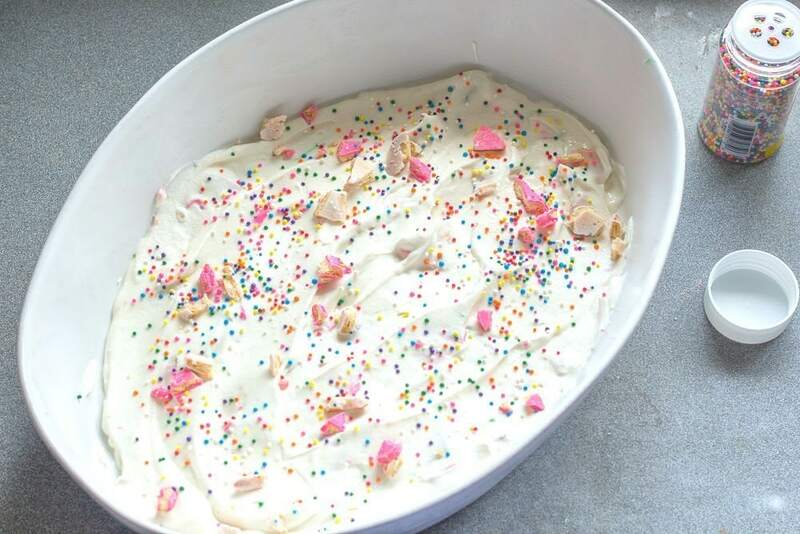 Add a layer of white ice cream to the serving bowl, then go crazy with sprinkles on top and more cookie chunks. Next add a good layer of pink ice cream base and add more sprinkles and cookies Alternate colors until all ice cream base is used up. Gently run a knife through the ice cream to create a pretty swirl pattern. 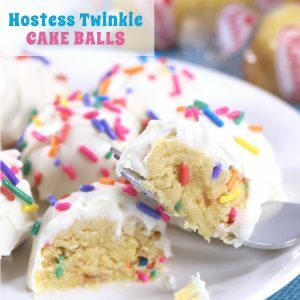 Be careful not to over-mix or the colors will start to bleed from the nonpareil sprinkles. 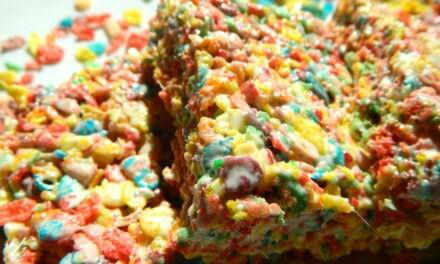 Now top it all off with extra cookies crumbs or whole circus animal cookies and of course, lots more sprinkles. Put the container back in the freezer for 4-6 hours or until firm. Now scoop it up, add to cute serving dishes and enjoy! 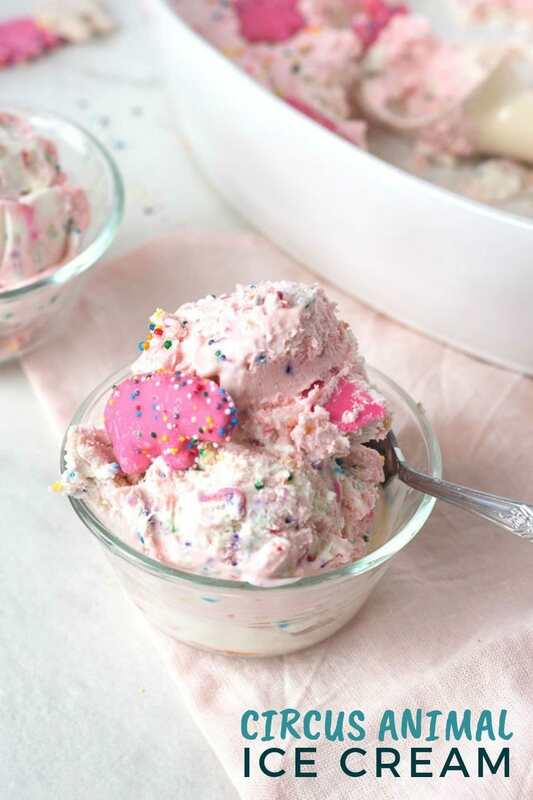 Not only is this ice cream cute and delicious, it's incredibly easy to make. 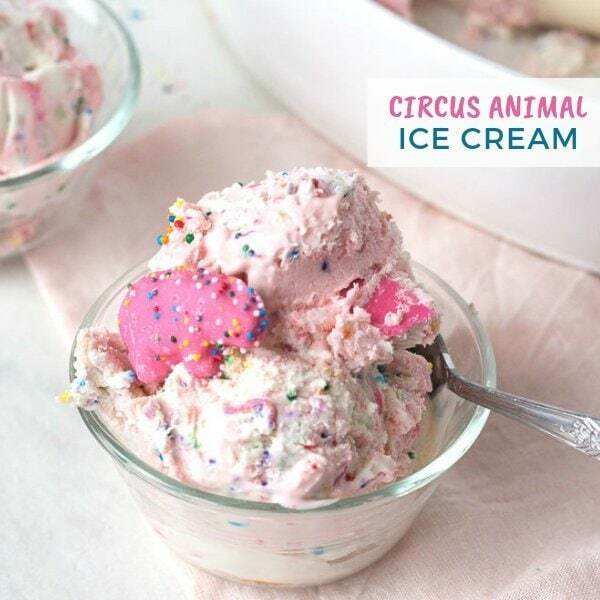 Every bite is packed with sweet circus animal cookie flavor that will bring you back to your childhood. Grab a bowl or container that will hold 6 cups of liquid and place it in the freezer. This will be the container that you store and/or serve your ice cream in. 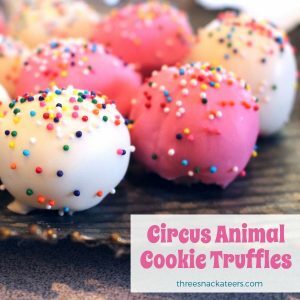 Place circus animal cookies on a cutting board and give them a rough chop. Set about about a half cup of chopped cookies and some whole cookies for later. Next, get 2 large bowls. In one, pour the sweetened condensed milk, vanilla and chopped cookies. In the other bowl, whip the heavy cream until stiff peaks form. Add about a cup of the whipped cream into the condensed milk bowl and fold in gently. 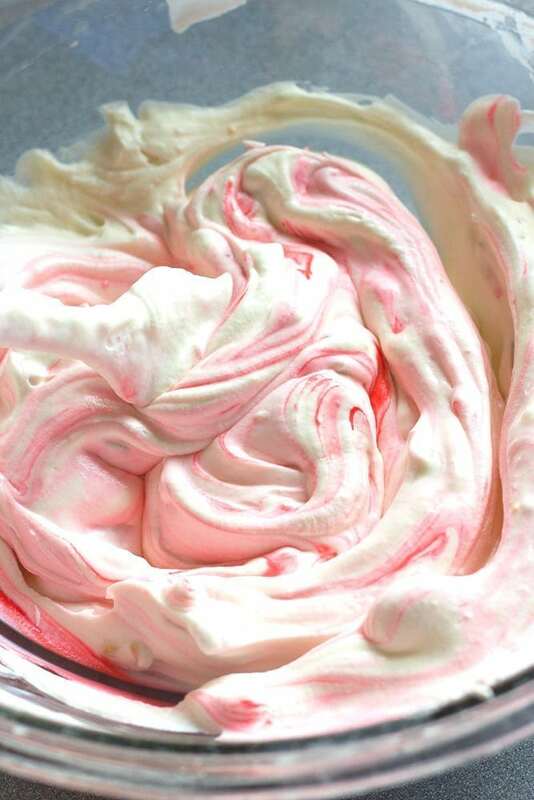 Add in the remainder of the whipped cream and quickly fold into the mixture. Transfer half of the mixture back to the original bowl. 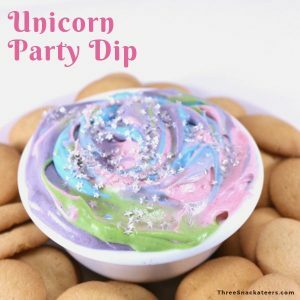 Add several drops of food coloring until you achieve a pretty pastel pink color that is similar to the color of the pink animal cookies. Remove your serving dish from the freezer. Add a layer of the white mixture to the dish, add some sprinkles. You can also add extra cookie chunks if desired. 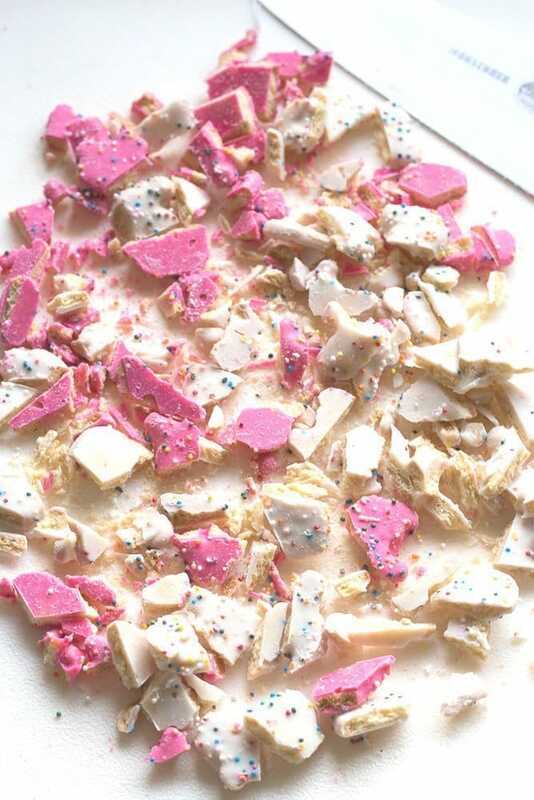 Then add a pink layer and some sprinkles. Alternate colors until all of the ice cream base is used up. Run a knife through your mixture a few times to create a swirl pattern. 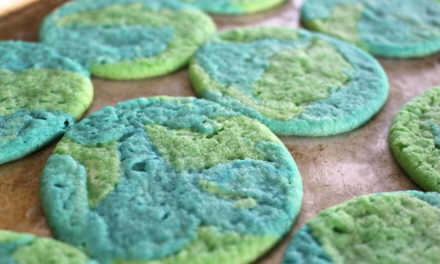 Be careful not to over mix or the colors will start to blend too much and the color from the sprinkles will bleed. Add more sprinkles. some crushed cookie crumbs and/or whole cookies to the top for garnish. Put the serving dish back in the freezer. Freeze for 4-6 hours or until firm. 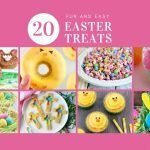 Scoop it up, serve in cute bowls and enjoy!